In the early 1950s, some senior officers thought that all US Navy carrier aircraft would be Vertical Take Off (VTO) machines within 10 years. They were wrong, but it took such machines as the X-13 Vertijet to prove it. 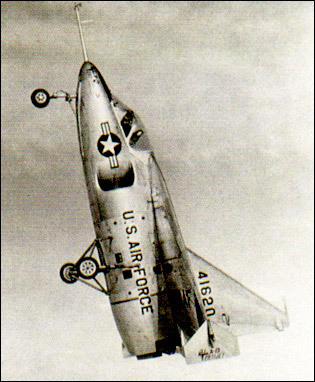 The delta-winged X-13 used a unique landing method, involving a special trailer, a hook and a striped pole.To land the pilot had to approach the trailer's vertical base board without being able to see it. A pole marked with gradations protruded from the board and the pilot had to use this to judge his 'altitude' from the landing wire. In one demonstration at the Pentagon, the X-13 flew from its trailer, crossed the Potomac River, destroyed a rose garden with its thrust and landed in a net. Although this impressed the top brass, further funding was not forthcoming and the project petered out. Plane proved VTO is possible, modern engines have plenty power. The X-13 never landed in a net, and did not destroy a rose garden. In fact, the boxwood hedges were previously watered down in order that leaf litter did not circulate up and choke the engine while the X-13 landed. The plane was a proof-of-concept device (two were built), and was never intended for production, the project simply ended. � The seat tilted forward 45 degrees to give the pilot a more comfortable position during vertical flight. Many early flights were made with no canopy to give him a better chance of escape. � The British Avon engine was the most powerful available for its size and gave the X-13 the 1:1 rhrusr-to-weight ratio necessary for vertical flight. � The first VTO flights were conducted with a crude framework around the tail section with castoring wheels at the bottom. � As first built, the X-13 had a huge fin, its height nearly as great as the wingspan. This was shortened during later testing.